An absolutely new wonder in our garden! We’ve never imagine that our Dieffenbachias would ever bloom because we’ve been having them for years and not a single appearance at all to greet us thus far! But our garden surprises never cease to amaze us! 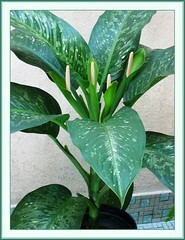 This variety of Dumbcane, the Dieffenbachia bowmannii ‘Carriere’ that joined our garden family last July as a very young plant suddenly jolted me on the lovely morning of March 10 with one full bloom and three tiny buds! Wow! I was in rapture and ran like a young girlie to beckon my beloved hubby who was at the frontyard to come inside the courtyard and see! He too couldn’t believe his eyes and was as fascinated as I! 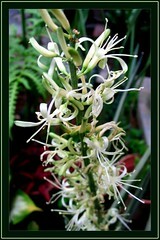 Here’s sharing some images of dief’s blooms to enthrall you too! 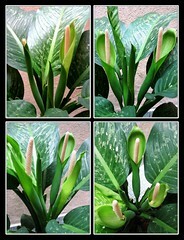 These are recent images of the Sansevieria’s glorious blooms! Unlike the first July blooms previously that lasted almost a month in good sunny days, these fabulous blooms withered within 2 weeks of flowering due to the persistent rainy weather. I grow my Sasevieria trifasciata “Bentels Sensation” indoors in a clay pot under fluorescent lights. It has sent up new plants that withered and died. Also, it is developing brown “rust” at base which appears to going up the leaves. Roots appear fine. Did not see any insects. My heart is broken. It took me e years to find it. What do you think the problem is? Sorry, no idea as to the depressing condition of your plant. What I do know is that this hardy sansevieria loves the sun, tolerates drought but thrives better when well-watered but not soggy, and potting medium should be free-draining.